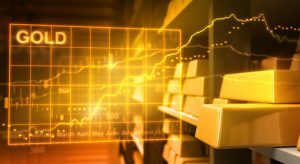 Gold futures registered a third straight loss Friday but still advanced for a second week in a row. Other precious metals also posted weekly gains despite end-of-week declines. Gold for December delivery on Friday fell $7.10, or 0.5%, to settle at $1,334.50 an ounce on the Comex division of the New York Mercantile Exchange. Gold has seen "gains on disappointing economic data, but Fed speakers have caused the market to rethink their view on rate increases," MarketWatch quoted Robert Haworth, senior investment strategist with U.S. Bank Wealth Management. "Gold now appears to be reflecting the stronger dollar and rising odds of a Fed rate increase in 2016." "This week, 15 analysts and traders took part in the survey; about 46% of the experts expect prices to trek lower next week, while the remaining participants — split evenly at 27% — see higher or neutral prices. Meanwhile, sentiment on Main Street was a little more optimistic for the yellow metal. This week, 664 Main Street participants voted on the online survey, of which 438 voters, or 66%, are bullish. At the same time, 136 participants, 20%, expect lower prices while 87, or 13%, are neutral." Also lower for a third straight day, silver for December delivery dropped 31 cents, or 1.6%, to settle at $19.368 an ounce. Silver futures ended virtually flat this week, rising less than a half penny, after soaring 3.8% a week earlier. Silver remains the best-performing precious metal for the year to date, up 40.3%. October platinum settled down $17.20, or 1.6%, to $1,067.50 an ounce, but logged a 0.5% weekly gain. Palladium for December delivery lost $8.40, or 1.2%, to $679.45 an ounce, but tacked on 0.9% this week. Both metals are higher on the year so far with gains of 19.5% for platinum and 20.9% for palladium. Gold declined $12.55, or 0.9%, to $1,330.85 an ounce. Silver fell 52 cents, or 2.6%, to $19.41 an ounce. Platinum declined $15, or 1.4%, to $1,073 an ounce. Palladium fell $16, or 2.3%, to $678 an ounce. Their weekly increases tallied to 0.5% for gold, 3.5% for silver, 2% for platinum and 1.2% for palladium. Gold coins advanced 22,000 ounces after climbing 23,000 ounces last week. This week’s splits include 18,500 ounces in American Gold Eagles compared to 20,500 ounces previously and 3,500 ounces in American Gold Buffalo compared to 2,500 ounces previously. Silver coin sales advanced 177,500 ounces after rising by 552,500 ounces previously. The weekly splits include 170,000 ounces in American Silver Eagles compared to 410,000 ounces previously and 7,500 ounces in America the Beautiful Five Ounce Silver Uncirculated Coins compared to 142,500 ounces previously. To purchase any gold at this point in time would be considered more than risky. The point being; if one purchases a gold coin, there shall not be any secondary market to make a profit. This facet is only relevant to the current gold issues. Naturally, the numbers dictate the intrinsic value of any coin but gold is far too expensive. To me, Bullion is just that…Bullion. Those who are licensed to sell are contractually obligated to buy back. Gold and silver have done amazing things this year. The increase and value of gold and silver since the beginning of 2016 has been good. Numismatic coins are beyond gold value…low mintage is key. At the end of the day, it does not matter if a mint produces 1 million or 2 million Bullion coins as it is straight cash for precious metals. Any increase in Bullion value is cash in the bank, and temporary loss is just part of the game. Waiting for gold to bottom out is a loss. Mouse was correct when he pointed out that it doesn’t mater if they make 1 million or 2 millon gold bullion coins, that isn’t going to affect their value at all! I don’t think it is better to buy rare coins instead of bullion. I think if the economy was to collapse that the fellow with a lot of bullion will be in much better shape than the one that has a couple of “rare” coins that will be essentially worthless – aside from the intrinsic bullion value of their weight.